As I reflect on that day 12 years ago, I was very young only 21 years old, almost 22. I was a ham radio operator and had been since I was 15. I had completed EMT school in June and I had just started my journey into the fire service by joining the call fire dept for the town of Plainville, MA back in April. I was working for a company that sold, serviced and installed business telephone systems as a service and installation technician. As I began my day of work, I had to go to the office in Walpole to turn in work orders get new ones and get supplies for the next few jobs I was going on. While I was at the office, I had gotten word of a plane hitting one of the towers and we all thought that it must have been a small private plane. As I left the office and went to the coffee shop around the corner they had the news on with pictures of the building on fire. For the rest of the day I strictly listened to WBZ radio AM 1030 (not very common for a 21 y/o). As more and more news came in about the events unfolding down in NYC I had less and less of a desire to be at work and wanted to go home even if it was to just watch TV and see what was happening. I was also looking for anyway to go down to NYC and help because after all I was part of the “Brotherhood” (even if it had only been for a few months). My department never sent anyone down to NYC. I was even looking for other ways to try and go down as well but they were hard to find and were all on a voluntary basis and I was also afraid of loosing my job if I just up and left for a week. For about the next week I continued to go to work every day but would only listen to WBZ AM 1030 until they went back to their normal program schedule but my heart was with everyone of the first responders and rescue workers that were down at the site. 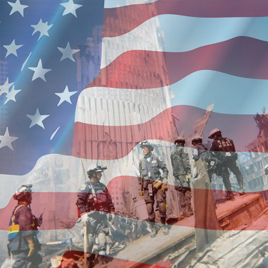 To this day I always take time to reflect and remember the events of that day and whenever I hear the song “Where Were You When the World Stopped Turning” by Alan Jackson I pause and reflect. As I furthered my career in the fire service, I began to meet individuals that were members of MATF-1. Being curious, I researched MATF-1 and was immediately interested in becoming a member. I knew that this was what I was looking for in September of 2001, to be part of an organization to respond to a disaster and help in any way possible. It was January 2008 that I was given the opportunity to join the most elite and professional group of people that I have ever had the pleasure of working with. I am glad to be part of MATF-1 and to be able to work with some of the smartest people I have ever had the pleasure of knowing.